It can be natural for many of us to repress our emotions and deeper thoughts or desires, but this almost always has a negative after affect. Repression can lead to a lot of stress and just all around unhealthy behavior, but it often manifests differently in each person. 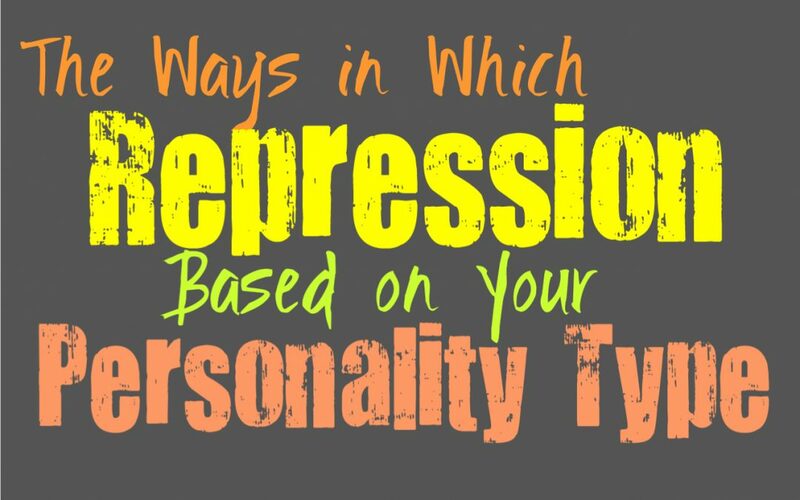 Here are some ways in which repression might affect you, based on your personality type. INFJs do have trouble with repression oftentimes, since they don’t feel as comfortable sharing their inner thoughts and feelings with others. INFJs simply keep a lot to themselves since this is what feels more natural for them. They often feel it is safer and just wise to keep things inside rather than share with those around them. Sometimes INFJs can even feel repressed by the people in their lives, especially if their complexities don’t match up with expectations. This repression definitely has a way of eating at the INFJ and making them feel trapped. They often need to find outlets for it, even if that just means making connections with people who will appreciate and not judge. ENFJs do sometimes repress their deeper feelings and thoughts, especially if they might upset the people they care for. ENFJs have a perfectionist nature and so if they are struggling with something they might not want others to know. When the ENFJ goes on too long repressing certain parts of themselves, it often leaves them feeling overwhelmed and unappreciated. This inability to really share themselves with those closest to them, might cause them to build up stress and become a bit more short-tempered than usual. This is something that will weigh even heavier on the ENFJ, since they don’t like behaving this way. INFPs will struggle immensely from having to repress their thoughts and feelings, and this will leave them feeling trapped. INFPs might not want to share with everyone, but they do need to have people to share with. They often feel truly stifled if they do not feel safe to be themselves or express themselves openly. For the INFP having this outlet is vital or else they become unhappy and might withdraw even more inward. While they are introverts who do enjoy this time alone, too much of it leaves them feeling lonely and misunderstood. For the ENFP repression is definitely something that causes them to feel unhappy and a bit depressed with their situation. They need to have people to connect with who will not judge them for being themselves. When the ENFP feels constantly stifled and as if they need to repress certain thoughts or feelings, it actually hurts them deeply. They take this personally and feel like this is an attack on who they are as a person, and in many ways it is. They need to be around people who allow them to openly be themselves, even if it makes others uncomfortable sometimes. INTJs do sometimes find themselves repressing things, especially their emotions. This repression is something they often see as self-control, but over time it can weigh on them in ways they don’t fully recognize. It often manifests by building up inside of the INTJ, until a small thing might cause them to snap or become emotional which is completely unusual for them. The normally calm and level-headed INTJ can become short-tempered or even take something personally. The INTJ can also become so stressed that they find themselves acting out of sorts and will be a bit more reckless with their behavior, but this is more likely to happen when they repress something very serious. ENTJs do have a tendency to repress their emotions, mostly because they see this as controlling themselves. People who are overly emotional and expressive, seem a bit foolish and even immature to the ENTJ. They believe in controlling themselves and so sometimes this causes them to repress some more important things which they should be sharing. When this occurs the ENTJ can find themselves more short-tempered and might snap on people they ordinarily would not want to upset. The ENTJ can even be a bit more reckless than usual, since their emotions are boiling up inside of them. INTPs do sometimes repress their thoughts and emotions, since they aren’t the most open people. This repression can cause the INTP to second guess themselves, and over-analyze information in hopes of making sense of things a bit better. The INTP who represses too much might become short-tempered and angry with their loved ones without fully understanding why. These thoughts and feelings they are keeping bottled up inside start to find little ways of coming out, and this causes them to have more trust issues with those close to them. ENTPs don’t like allowing their emotions to come out constantly, but they do try to prevent themselves from repressing too much. While they might attempt to avoid repressing their thoughts and feelings, like most people it does occur sometimes. When the ENTP finds themselves repressing something for a long time, it can cause them to retreat more than usual. In most cases the ENTP wants to be around friends and loved ones, but when they are feeling overwhelmed they can become a bit closed off and even avoid too much interaction. ISTJs are often rather private people, but this does cause them to repress their emotions and needs sometimes. They can be so focused on taking care of things and keeping a sense of poise that they do find themselves repressing a great deal. For the ISTJ there are often smaller ways for them to cope, and this usually comes from spending time alone and being able to process their thoughts without having people hovering. They can often handle repression better than most types, since keeping things to themselves is more natural for them. For the ESTJ repressing and keeping things to themselves is often much more natural than sharing or opening up. While it might come naturally to them, it still can cause some undue stress from time to time. When the ESTJ has something which is bothering them deeply, they often find themselves feeling more short-tempered and on edge. The will have a hard time really dealing with people and will have little patience for anyone making major requests of them. The ESTJ who is repressing something that is bothering them, is likely to need more time to themselves. ISFJs who find themselves repressing their thoughts or feelings, can be a bit more emotional than usual. They might find themselves losing their temper or become upset over small things that happen to them. Repressing their feelings for a long period of time leaves the ISFJ struggling to feel appreciated by their loved ones and friends. When this occurs they can become bothered by the smallest of things and seem a bit more stressed than they usually are. When ESFJs are repressing something serious they often try to become laser focused on certain larger tasks. They find themselves buried in projects and try hard to distract themselves from whatever thing is actually bothering them. ESFJs often do this because they don’t want to be burden and would rather keep things to themselves instead of bother others with it. When the ESFJ represses something for too long they often find themselves much more stressed, and even a bit more emotional than usual. ISTPs are actually rather internal and private people and so they don’t often feel the need to share things with those around them. In most situations the ISTP keeps their thoughts and feelings to themselves, unless they feel otherwise inclined to share. They do sometimes repress their emotions though, not wanting to really dive into them deeper. When the ISTP finds themselves repressing something which is truly bothering them, it can cause them to behave as distant and makes them a bit impatient with the people they love. ESTPs really don’t like having to repress certain thoughts or feelings, especially when they are around their loved ones. It actually feel unnatural for the ESTP to keep their thoughts to themselves, especially something important to them. When they have to repress things it can be troubling for the ESTP and leave them feeling trapped in some ways. They might become much less outgoing and far more short-tempered than they usually are. For the ESTP it is vital to have someone who allows them to vent without judgement, or else they can become reckless and even a bit temperamental. ISFPs can be somewhat private around new people, but when they are around loved ones they naturally prefer to share. They don’t like keeping things bottled up, and so the ISFP who is repressing something is often very unhappy. When they have to keep parts of themselves locked away it leaves them feeling unloved and completely unappreciated. They need to feel connected to those around them, and for the ISFP it is truly important to be able to share whatever crosses their mind. The repressed ISFP is likely very withdrawn around certain people, but might step into reckless behavior when they are around others. For the ESFP repressing their thoughts or feelings is just not natural, and so it can deeply affect them. When they are repressing something it often feels like they are being stifled or forced to be insincere. For the ESFP it is important to be around people who are accepting of who they are, even when they are a bit over the top or even odd to some people. When they have repress something it is often because someone is suggesting they should, and this is deeply troubling for the ESFP. They will often feel depressed and might ultimately need to break away from the person making them feel this way.